August 7th, 2013 was the premier of the DVD ‘The Story Behind the Roads’. This tells the history of the street names of Tilbury town featuring voice overs from June Brown, Peter Hewitt MBE , Les Morgan, Sue Yates, Jack Doodes, Shirley Doodes, George and Shelia Ridges and Project manager Annie O’Brien. The memories room was open for browsing, refreshments and the chance to play the game of TILOPOLY. The new Tilbury and Chadwell calendar was on sale. There were free copies of the A-Z of Tilbury Street names. Very good film but where is the pictures of the bridge over the riverside station. I have not seen any pictures of it yet. So if anybody has got any can they put them on the site. As I lived in Tilbury from 1947 up till 1958 when we moved to Chelmsford. 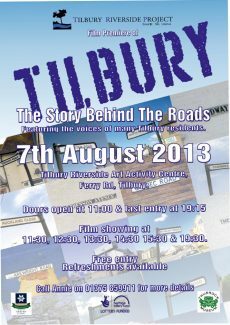 Very interesting production and good for younger generations and newer Tilbury residents. 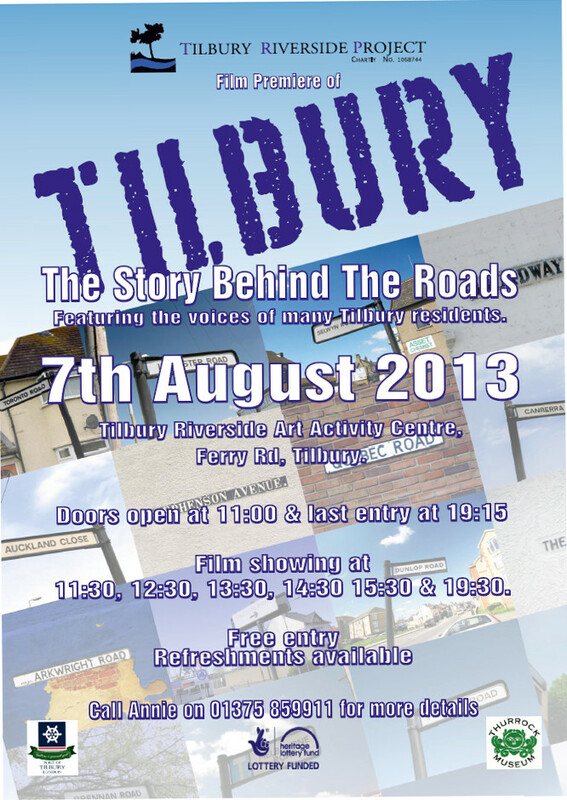 do you think BBC might be interested in using it for a programme about Tilbury and how it has changed over the years? A good idea! I will keep it in mind. i have got the calendar, a to z book and dvd and i have found them to be really interesting. Hope other items become available. Thankyou they have brought me many memories. How about a book made up of the photos you have got on this webpage. Afraid I don’t know. Have a book of my nan’s (who lived in the street all her life) with her address in the front and she dated it 1927, so after then. I’ve seen a map of 1952 where it is North View, so some time between. Thanks for that Lea, when did it change the name. Hi, can anyone tell me where Park View Avenue used to be in Tilbury. My father was born at number 11 but it is not on modern maps. Park View Avenue was what is now North View Avenue. you can also get them from Tilbury Library during normal opening hours. [Note: This comment (and a number of others) was not published at the time it was submitted. Our apologies to everyone for the mistake. I don’t know whether there are any copies of the video left. I believe that you can get them from Annie at the TRAAC. Contact her first though, because she is not there every day. I suspect that they will be available at the event on October 11th as well. Hi could you please tell me where we can get the tilbury and chadwell calendar from?